Nant yr Eira lies in the community of Llangurig in the county of Powys . It is located at Ordnance Survey national grid reference SN82708730 . The mine is recorded in the CPAT Historic Environment Record as number 725 and this number should be quoted in all correspondence. A shaft is located to the east of the dressing floors at SN82738744. There is a long prehistoric opencut on the lode to the north of the dressing floors SN82628746 with a 19th c. shaft through its base at the southern end. 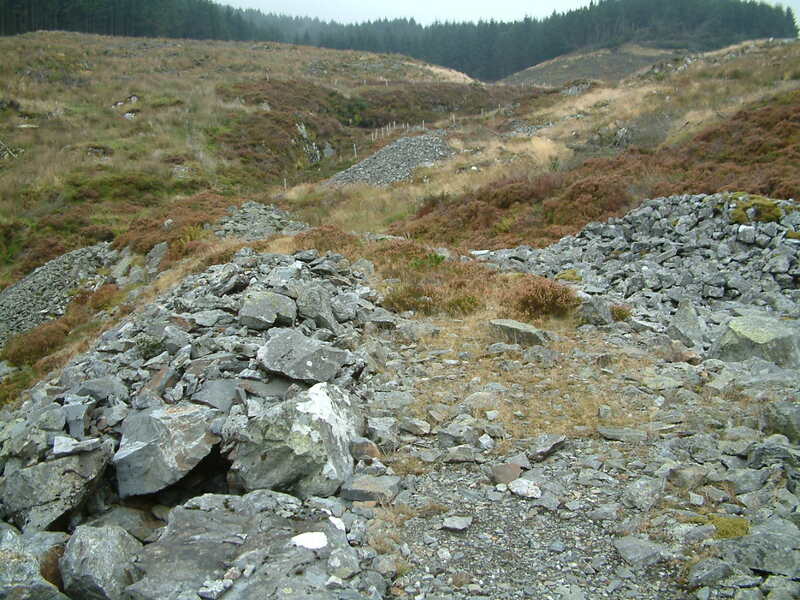 The Nant Yr Eira stream was formerly diverted around the top of these workings in a leat but now cascades into the workings as a waterfall at the northern end. Another shaft is located near the source of Nant Yr Eira to the north-west at SN82208660. There are numerous trials on the hillside to the east of the stream at SN82678747. Short sections of tramroad extend along the 19th century spoil tips from the 2 shafts close to the dressing floors. One of these can be traced to 2 ore bins while the other ends to the rear of the crusher house. There are 2 wheelpits on the dressing floors. One of these drove the crusher house (38x3ft) and also aided pumping. The other smaller wheelpit is located to the south of the platform on which the crusher wheel sits, its use is not clear. A reservoir exists upstream of the junction of Nant Yr Eira with the Afon Hore at SN82658773. Surviving remains include a crusher house, 2 round buddles and an ore bin with a picking table platform in front. Jiggers were presumably placed on the platform in front of the large wheelpit. All centred on SN82668731. A mine office is located to the east of the dressing floors and a magazine is sited on the hillside to the south-east at SN82908723.